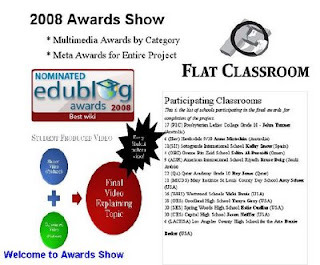 The Flat Classroom Project Awards Ceremony, held yesterday online in Elluminate, showed once again what a special community of learners we have here as part of the Flat Classroom Project. All award information can be found on the Awards wiki, including multimedia awards for all 11 topics and meta-awards, showing the top 3 videos for the project. Over 200 students from 15 schools attempted the Flat Classroom Project over the past 3 months. Nearly 100 videos were submitted from 12 schools for final awards. All multimedia can be found on the Flat Classroom Project Ning as well as hyperlinked from the main wiki pages and embedded in sub-wikis. This is a mammoth effort! We have spent the past 2 weeks running through teacher and student reflections on the project, once again in Elluminate, where participants had an opportunity to share their work, thoughts and ideas for the past and future development of the project. Congratulations however now goes to all of the people who have made this amazing global collaboration possible. Here is the list and location links were you will find specific names and details amongst the list of educators who willingly and freely devote their time. - Judges of the multimedia artifacts, who spent hours reviewing and deciding who deserved recognition above others, with a special mention to our meta-judge, Barbara Stefanics. Special thanks to the teachers of the classes in the project. Some had been through the project before, others were new to the demands. Everyone did an excellent job! We held weekly meetings in Elluminate for teachers that were recorded for those who couldn't make it. Our time-zone stretch allowed us to just squeeze in Australia and the Middle East (Oman at midnight and Melbourne at 7am!). Special thanks also to our project 'Janitor' (his words!) for always being around to clean up and help out, Steve Madsen from Australia. In fact this is a double celebration as Steve just informed us today he received an Outstanding Professional Service Award Citation from the Computing Studies Teachers' Association in NSW. Well done Steve!! A special, special thanks also to my unique and visionary colleague, Vicki Davis, who as always has put her heart and soul into this project, and expects nothing less from her students. This was a different project for me as for the first time I was not in the classroom with my own class, but merely facilitating the project overall and helping my colleague, Ray Jones with his class. I enjoyed having a lofty overview of every class, wiki and multimedia piece, however I really missed having that more intimate classroom knowledge of each student, their trials and tribulations and ultimate success. One of the memorable events during the project was being in a student summit recently where, for the first time ever, we had students from Oman (Middle East) in Elluminate presenting during the same session as students from the USA (LACHSA, California). Participants commented that this real-time experience made the whole project seem more 'real' and tangible. I enjoyed listening to the different accents and observing the excitement of the students as they realised this was a true cultural exchange . For those interested in joining a Flat Class Classroom Project we have Project 2009/1 starting in January. I invite you to fill in the online form registering interest before the first week in January. Congratulations to you Julie! You constantly amaze me with your powerhouse work ethic and never-ending stream of ideas to connect students using technology. Another great FC project completed! Can't wait for the next one!